Thread: Hack your brain ! DO YOU EVER want to change the way you see the world? neuroscience Wouldn't it be fun to hallucinate on your lunch break? Although we typically associatesuch phenomena with powerful drugs like LSD or mescaline, it's easy to fling open the doors of perception without them: All it takes is a basic understanding of how the mind works. The first thing to know is that the mind isn't a mirror, or even a passive observer of reality. Much of what we think of as being out there actually comes from in here, and is a byproduct of how the brain processes sensation. 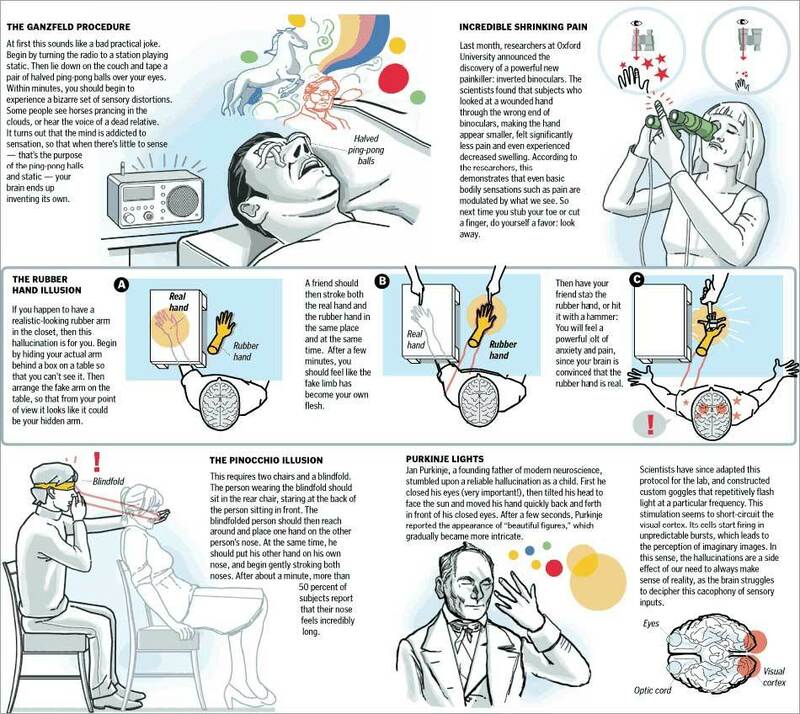 In recent years scientists have come up with a number of simple tricks that expose the artifice of our senses, so that we end up perceiving what we know isn't real - tweaking the cortex to produce something uncannily like hallucinations. Perhaps we hear the voice of someone who is no longer alive, or feel as if our nose is suddenly 3 feet long. What a great stuff buddy.But Please don't try to change the world. WOW! That was very informative. I hope you keep doing post like this. I really enjoy it! I'm gonna try some later. It's so nice that you are entertained and learn new stuff like this. It is interesting as well as informative but putting such things into practise involves a risk of permanently getting absurd. Jokes apart, but I do believe that though you can influence someone's mind under a certain situation which is called hypnotism but I don't think that you can hypnotise yourself like that. I am so glad I found this forum! I would like to add that these kinds of phenomenon are not only fun, but are (in some cases) potentially therapeutic. Here is an example of what I am talking about, this is an article (by a nonprofit organization), about how to reduce or eliminate social anxiety disorder symptoms through a kind of visualization process. Warning, the article is a little long-winded, and is written for lay readers, but it basically outlines a way of "tricking the mind" into overcoming an anxiety disorder, Social Anxiety and Dream Work. DO YOU EVER want to change the way you see the world? Wouldn't it be fun to hallucinate on your lunch break? Although we typically associate such phenomena with powerful drugs like LSD or mescaline, it's easy to fling open the doors of perception without them: All it takes is a basic understanding of how the mind works. Last edited by Jameson; 05-04-2010 at 03:41 AM. Nice, I gotta try this! Optimize your brain, optimize life! Check out the latest news on brain supplements and neuroscience! I don't think I will even stop being amazed by all the secrets that brain contains! Very interesting. Why theme is not continuous?